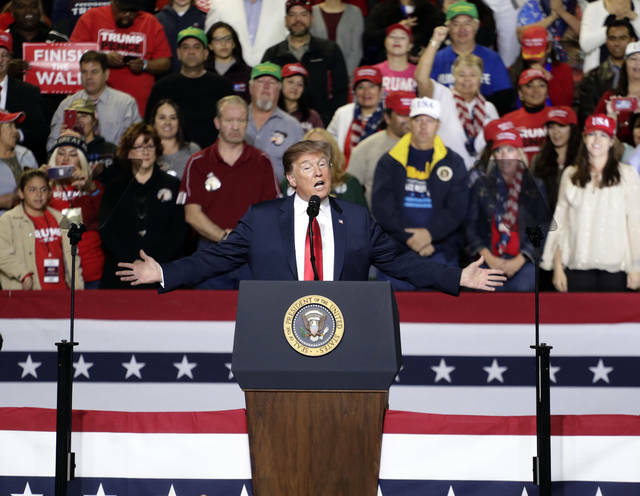 In the first dueling rallies of the 2020 campaign season, Trump’s “Finish the Wall” rally in El Paso went head-to-head Monday night against counter-programming by Beto O’Rourke, a former Democratic congressman and potential Trump rival in 2020, who argued that walls cause more problems than they solve. The rallies across the street from each other served as a preview of the heated years long fight over the direction of the country. 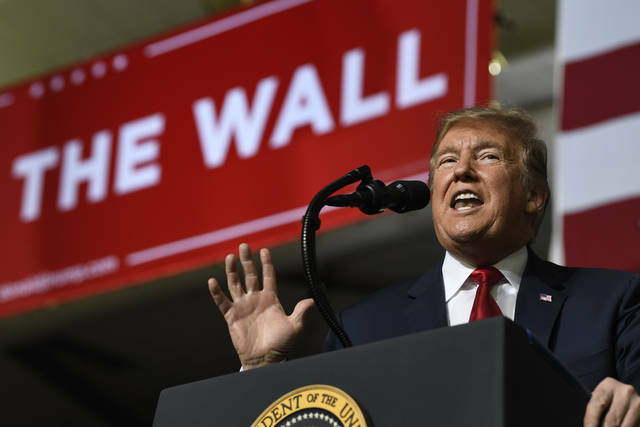 And they made clear that Trump’s long-promised border wall is sure to play an outsized role in the presidential race, as both sides use it to try to rally their supporters and highlight their contrasting approaches. 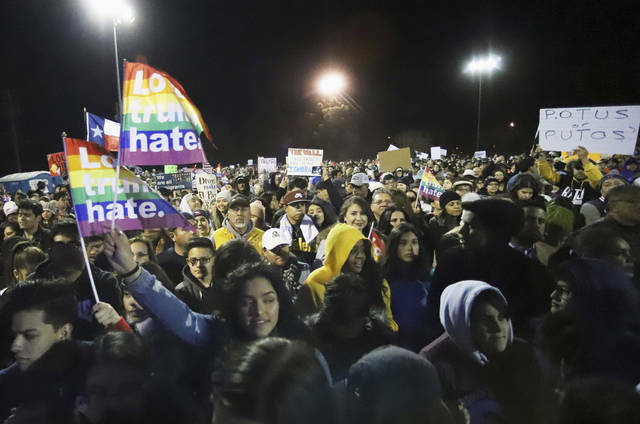 O’Rourke, meanwhile, held a counter-march with dozens of local civic, human rights and Hispanic groups in his hometown, followed by a protest rally attended by thousands on a baseball field within shouting distance from the arena where Trump spoke. The agreement means 55 miles (88 kilometers) of new fencing — constructed through existing designs such as metal slats instead of a concrete wall — but far less than the 215 miles (345 kilometers) the White House demanded in December. The fencing would be built in the Rio Grande Valley in Texas. It actually closely mirrors Trump’s original budget request from last winter, however. Details won’t be officially released until Tuesday, but the pact came in time to alleviate any threat of a second partial government shutdown this weekend. Negotiators said it’s pretty much the deal that Trump could have gotten in December. Aides revealed the details under condition of anonymity because the agreement is tentative. “Our staffs are just working out the details,” said House Appropriations Committee Chairwoman Nita Lowey, D-N.Y. She said the huge measure — which combines seven spending bills into one — measure would be publicly released as early as Tuesday afternoon. “I would hope that Sean Hannity and all the other people you mentioned aren’t running this government. This was a bipartisan deal, Senate and House, Republican and Democrat,” top negotiator Rep. Nita Lowey, D-N.Y., said on CNN. “When we sat around the table and negotiated this deal, we didn’t call Sean Hannity, we didn’t call (Ann) Coulter.” Coulter is a conservative commentator. Disclosure statement: William E. Nelson does not work for, consult, own shares in or receive funding from any company or organization that would benefit from this article, and has disclosed no relevant affiliations beyond their academic appointment. In a Wall Street Journal interview three days after reopening the government, President Trump handicapped the odds of a border wall settlement. Shuttering the government for the third time since Trump took office remains possible, but is less likely now, given Monday’s progress towards a deal in Congressional talks over securing the border. Meanwhile, bipartisan support, including among prominent Republicans like Sens. Chuck Grassley, Lisa Murkowski, Lamar Alexander and Rob Portman, is rising for bills that would prohibit shutdowns. The president’s observable objective in this political conflict is getting money from Congress to build the border wall. As legal scholars who have spent much of our careers analyzing the interaction between government and society, including the economy, we believe that intentionally or not, the shutdown also was consistent with a goal long sought by a subset of the Republican Party – not to be confused with traditional, moderate Republicans – that wants to dismantle the government. These advocates of limiting government’s size have a traffic cop theory of the state, featuring a minimalist state focused on safety and security. Trump advocated shrinking the government as early as 2000. The Statue of Liberty, run by the National Park Service, was kept open for tourists with New York state funds during the shutdown. So Trump also has a traffic cop theory of the state: The government should protect personal safety and property rights, facilitate transportation and perhaps construct and maintain infrastructure. Many of Trump’s actions can be seen through this lens: In his first week in office, Trump imposed a hiring freeze on much of the executive branch, exempting the military, national security and public safety. Although the hiring freeze was lifted several months later, the number of federal employees decreased by 17,000 in the first 18 months that Trump was in office. Ten days after he assumed office, Trump signed Executive Order 13771 on “Reducing Regulation and Controlling Regulatory Costs,” which required eliminating two significant regulations for every new one. And Trump was just getting started. He issued another executive order, later declared illegal, making it easier to fire government employees. This New Year’s Day, he froze government workers’ pay. For some, including Trump advisers like acting White House chief of staff Mick Mulvaney and acting White House budget director Russell Vought, the shutdown was a useful exercise in limited government. Among the agencies affected by the shutdown, the Environmental Protection Agency only had 800 of 14,000 employees working. This stymied new regulations and regulatory inspections. The Commerce Department couldn’t release data from the Bureau of Economic Analysis and the Census Bureau, including home sales, wholesale and retail inventory, consumer spending, personal income, inflation, and durable goods orders. Not only is this data used for calculating important economic indicators like the gross domestic product, but businesses and even the Federal Reserve use it in their decision-making. Most of the FBI was working, but without pay, and the agency lacked the money to support costly cyber investigations or even to pay informants, thereby impairing their work. Most immigration judges were furloughed, causing thousands of immigration cases to be postponed. Many of the government’s watchdog activities were curtailed, such as fraud investigations, tax audits and identity theft investigations. Many government websites were down or not updated. Acquisitions, mergers, IPOs, bankruptcy proceedings and small business loans slowed or stopped. But as the shutdown continued, it became evident that those furloughed unpaid government employees add value to the economy and contribute to the nation’s security and well-being. The Chairman of the Council of Economic Advisers said that the economy may not grow at all in the first quarter owing to the shutdown. The FBI Agents Association and former heads of Homeland Security, including John Kelly, wrote to the White House and members of Congress expressing concerns about national security. TSA and air traffic controllers worked without pay, and the TSA absentee rate the weekend before the shutdown ended was a record 10 percent. A shortage of air traffic controllers caused massive airport delays, which many think prompted the reopening of government. The shutdown illustrated what some advocates have long wanted: a shrunken government. And it was an experiment that, as the above examples and many others illustrate, was not viable. Public pressure forced the reopening of the government – at the same size it was before the shutdown. John Attanasio, a legal scholar and author of “Politics and Capital: Auctioning the American Dream,” is a contributing author. Gene H. Bell-Villada: For decades now, libertarian ideologues have been calling for reduction of government strictly to military, security, and judicial functions. Trump’s shutdowns are thus exercises in precisely that. Libertarians must be pleased at the results.